The organ was made by John Snetzler in 1759, and rebuilt by John Banfield of Birmingham in 1906. It was restored by Edward Bennett, Martin Goetze, Stuart Dobbs and Roland Koch in 1995-6. The pitch was restored, a new mixture imitating Snetzler’s mixture at St Andrew-by-the-Wardrobe made to replace the 1906 Keraulophon, new stop knobs, restored wind chest, etc. 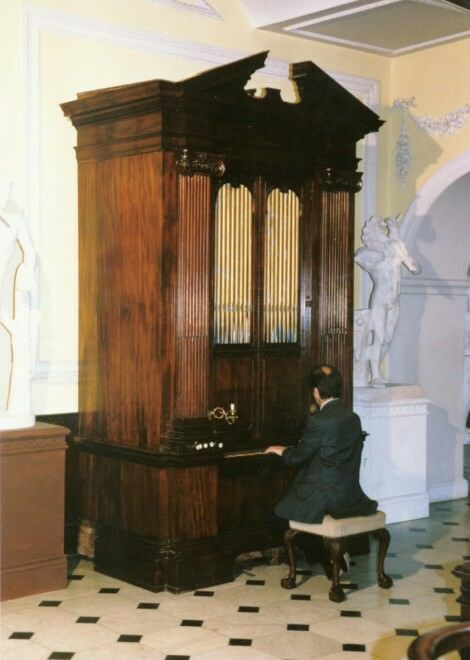 The organ was moved to Alec Cobbe’s Collection of musical instruments http://www.cobbecollection.co.uk/musical-instruments/ in the National Trust house at Hatchlands near Guildford in Surrey in 1989 https://www.nationaltrust.org.uk/hatchlands-park. It came from Wellesbourne Methodist Church 1916, and before that Barford Hill House, and originally Sherbourne Hall, Warwickshire. The shifting movement leaves the Diapasons, Dulciana and Flute. The pitch is now as originally a¹=425Hz.